Almost all covered workers have coverage for prescription drugs. More than three in four covered workers are in plans with three or more cost-sharing tiers for prescription drugs. For these workers copayments, rather than coinsurance, continue to be the more common form of cost sharing. As in prior years, nearly all (more than 99%) covered workers in employer-sponsored plans have a prescription drug benefit. An overwhelming majority of covered workers (90%) have a tiered cost-sharing formula for prescription drugs in 2014 (Exhibit 9.1). Cost-sharing tiers generally refer to a health plan placing a drug on a formulary or preferred drug list, which classifies drugs as generic, preferred, or non-preferred. Over the last few years, an increasing number of plans have created a fourth or even higher tier of drug cost sharing, which may be used for lifestyle drugs or expensive biologics. Employers often place various drugs in generic, preferred, or non-preferred tiers to encourage enrollees to select cheaper alternatives or to pass on to enrollees the higher costs of more expensive drugs. Sometimes employers will place high initial cost sharing for higher tier drugs but then include a coinsurance maximum to limit an enrollees total liability. 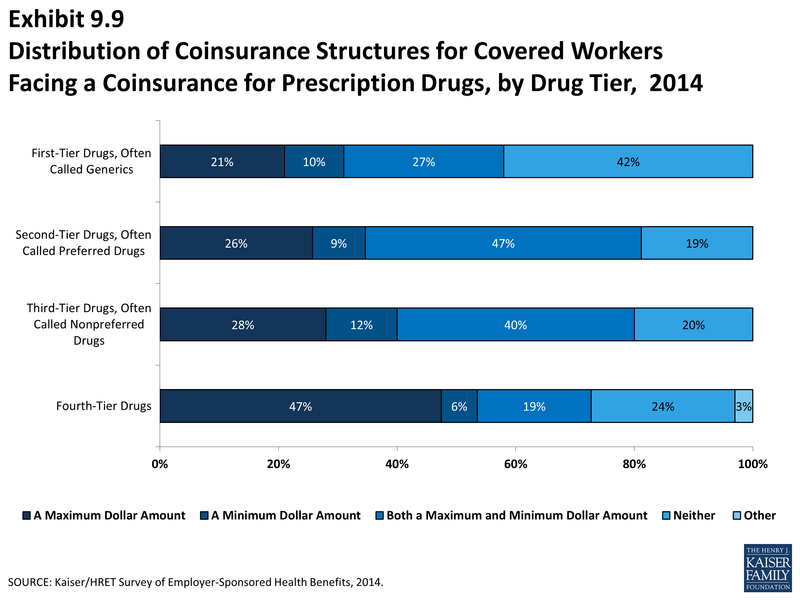 Eighty percent of covered workers are enrolled in plans with three, four, or more tiers of cost sharing for prescription drugs, similar to 82% of covered workers in 2013 (Exhibit 9.1). 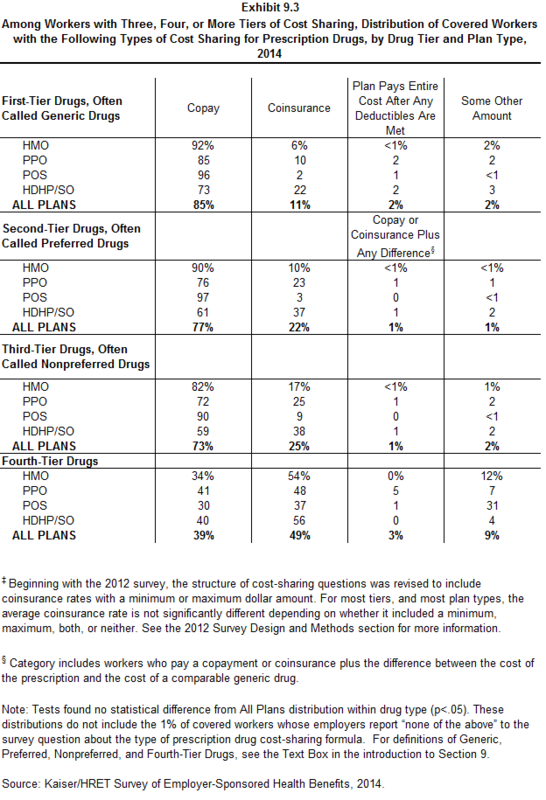 HDHP/SOs have different cost-sharing patterns for prescription drugs than other plan types. 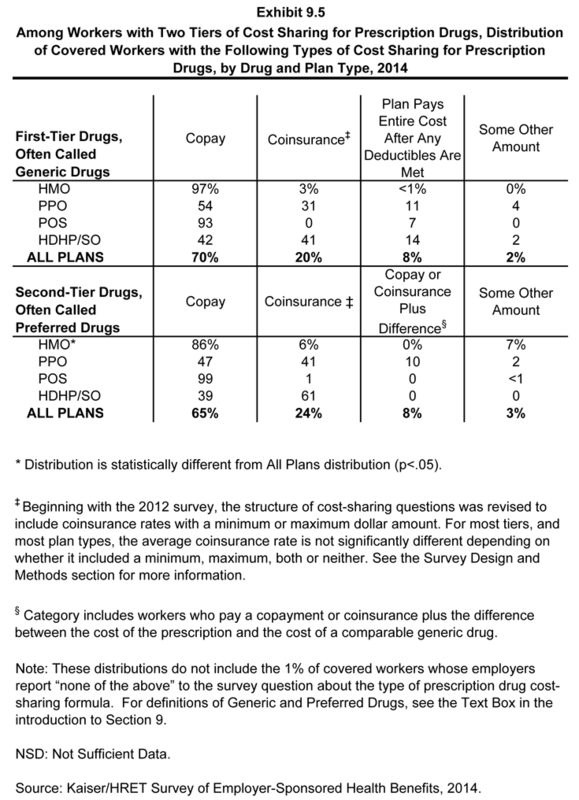 Only 43% of covered workers in HDHP/SOs are in a plan with three tiers of cost sharing for prescription drugs; 15% are in plans that pay 100% of prescription costs once the plan deductible is met (Exhibit 9.2). 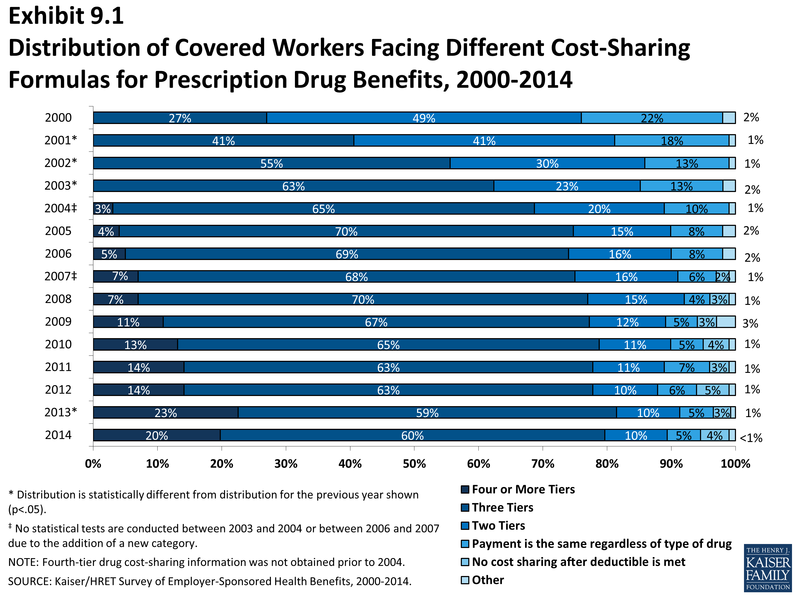 Twenty percent of covered workers are in a plan that has four or more tiers of cost sharing for prescription drugs (Exhibit 9.1). Among workers covered by plans with three or more tiers of cost sharing for prescription drugs, copayments are far more common than coinsurance in the first three tiers (Exhibit 9.3). For covered workers in plans with three or more cost-sharing tiers, 39% face a copayment for fourth-tier drugs and 49% face coinsurance (Exhibit 9.3). For covered workers in plans with three, four, or more tiers of cost sharing for prescription drugs, the average drug copayments for second-tier drugs ($31), third-tier drugs ($53), and fourth-tier drugs ($83) are comparable to the amounts reported in 2013 ($29, $52, and $80, respectively) (Exhibit 9.4). However, for first-tier drugs, copayments increased slightly from $10 in 2013 to $11 in 2014. For covered workers in plans with three, four, or more tiers of cost sharing for prescription drugs who face coinsurance rather than copayments, coinsurance levels average 19% for first-tier drugs, 24% for second-tier drugs, 37% for third-tier drugs, and 29% for fourth-tier drugs. These estimates are similar to last year (16%, 25%, 38%, and 32%, respectively) (Exhibit 9.4). 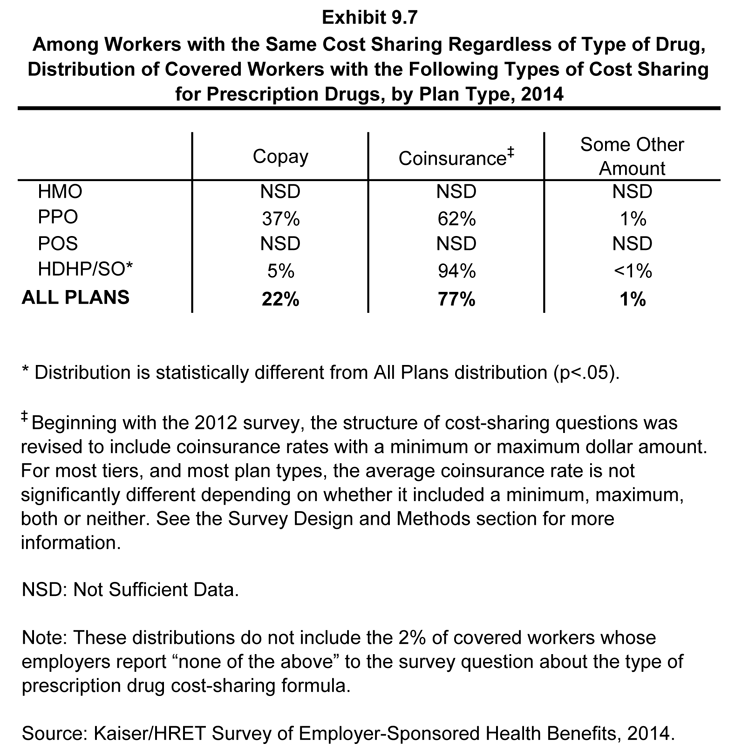 Ten percent of covered workers are in a plan that has two tiers for prescription drug cost sharing (Exhibit 9.1). Similar to workers in plans with more cost-sharing tiers, copayments are more common than coinsurance for workers in plans with two tiers (Exhibit 9.5). The average copayment for the first tier is $11, and the average copayment for the second tier is $30. The average coinsurance rate for the second tier is 27% (Exhibit 9.6). 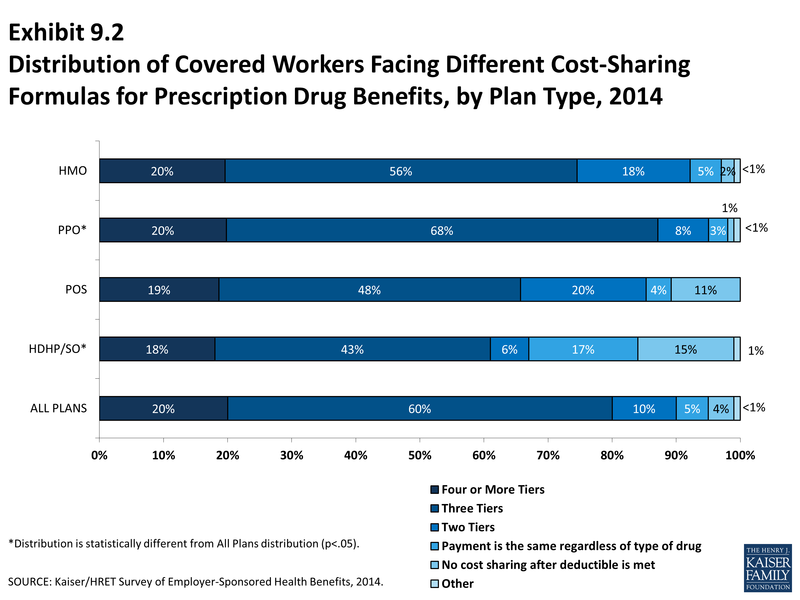 Five percent of covered workers are covered by plans in which cost sharing is the same regardless of the type of drug chosen (Exhibit 9.1)). For those workers with the same cost sharing regardless of the type of drug, the average copayment is $15 and the average coinsurance is 22% (Exhibit 9.8). Coinsurance rates for prescription drugs often have maximum or minimum dollar amounts associated with the coinsurance rate; for example for generic or first tier drugs, 21% of workers with a coinsurance rate have only a maximum dollar amount attached to the coinsurance rate, 10% have only a minimum dollar amount, 27% have both, and 42% have neither (Exhibit 9.9). Generic drugs: Drugs product that are no longer covered by patent protection and thus may be produced and/or distributed by multiple drug companies. Preferred drugs: Drugs included on a formulary or preferred drug list; for example, a brand-name drug without a generic substitute. Non-preferred drugs: Drugs not included on a formulary or preferred drug list; for example, a brand-name drug with a generic substitute. Fourth-tier drugs: New types of cost-sharing arrangements that typically build additional layers of higher copayments or coinsurance for specifically identified types of drugs, such as lifestyle drugs or biologics. Brand-name drugs: Generally, a drug product that is covered by a patent and is thus manufactured and sold exclusively by one firm. Cross-licensing occasionally occurs, allowing an additional firm to market the drug. After the patent expires, multiple firms can produce the drug product, but the brand name or trademark remains with the original manufacturer’s product.